Cognitive computing refers to the technology platform that is based on scientific disciplines of signal processing and artificial intelligence. These platforms encompass automated reasoning, machine learning, speech recognition, and natural language processing. Creating and assessing the evidence based on the hypothesis made on human communication and natural language, along with further learning and adaption from user responses and selections is the standard build of a cognitive system. Content analytics is a wide set of computer-assisted techniques for contextualized interpretations of documents. It is the amalgamation of mining and text analytics, which has the capability to visually explore and identify patterns, trends, and other statically available facts available in various types of content across several sources. Content analytics software is mostly used to give more perceptibility to the amount of content that is being generated. Data discovery is a type of system that scans the available data through different sources and extracts important information from data pertaining to the business goals. It is a decision-making platform that integrates, structures, and refines data. Transparency Market Research estimates that the global market for cognitive systems, content analytics and discovery software will exhibit an exponential CAGR of 23.5% from 2017 to 2025, rising from a valuation of US$9.88 bn in 2016 to US$60.06 bn by 2025. On the basis of application, the global cognitive systems, content analytics and discovery software market has been segmented in the report into machine learning, natural language processing, automated reasoning, speech analytics, text analytics, and social media analytics. Of these, the segment of natural language processing dominated in terms of revenue contribution to the global market in 2016. The vast rise in usage of smart devices is one of the key factors bolstering the usage of natural language processing tools across the globe. The segment of machine learning, which accounted for a 21.7% of the global market in 2016, holding the second position, is expected to emerge as one of the most attractive application segments over the report’s forecast period. The segment is expected to exhibit a massive 25.5% CAGR from 2017 to 2025. Increasing adoption of cloud based technology is expected to bolster the demand of machine learning tools across the world during the forecast period. 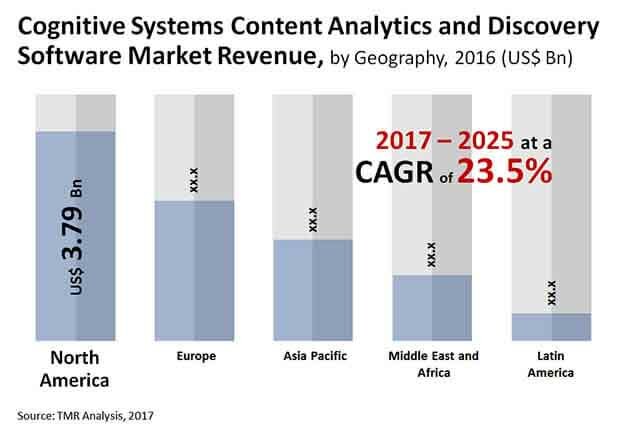 On the basis of geography, the global market for cognitive systems, content analytics and discovery software has been segmented in the report into North America, Europe, Asia Pacific, Middle East and Africa and Latin America. Of these, North America dominated the global market in 2016, accounting for a massive 38.4% of the overall market in 2016. Europe held the second dominant share in the global market revenue in 2016. The Europe market is expected to continue to lead upon a healthy growth path over the forecast period as well, driven by the vast rise in areas of application of artificial intelligence and the high demand of automation across the industrial sector. Asia Pacific presently holds a relatively smaller share in the global cognitive systems, content analytics and discovery software market but is expected to be one of the leading regional markets to decide the path of market’s growth in the near future. An impressive rise in digitization across the industrial, government, and public sectors and the vast rise in highly advanced IT infrastructure in the enterprise sector in countries such as India and China will continue to drive the Asia Pacific market in the next few years. The Asia Pacific market is expected to be one of the most promising investment avenues for global vendors as the regional market is expected to exhibit a promising 25.0% CAGR from 2017 to 2025. Some of the leading companies operating in the global cognitive systems, content analytics and discovery software market are Microsoft Corporation (U.S.), International Business Machines Corporation (U.S.), Google Inc. (U.S.), Symantec corporation (U.S.), SAP SE (Germany), Adobe Systems Inc.(U.S.), Palantir Technologies, Inc. (U.S.), Oracle Corporation (U.S.), OpenText Corporation (Canada), and SAS Institute, Inc. (U.S.). Increasing demand of connected healthcare systems is also an important trend in the global market. Connected healthcare systems are likely to collect real time data and information which helps in assisting clinicians in delivering better care and empower people to make better choices. It helps in reducing medical errors and enhances medical administration efficiency. Adopting cognitive systems in healthcare is likely to help physicians to find connections and correlations and identifying new patterns and insights to quicken treatments, discoveries and insights. Increasing demand of artificial intelligence is a key trend in the market. Demand for artificial intelligence is increasing significantly with the advancement in technologies, and it is an important trend in the cognitive systems, content analytics, and discovery software market. Artificial intelligence is witnessing market growth due to the rise in large and complicated data sets. The biggest revolution is machine learning, where instead of providing linear instructions to a computer, considerable amount of data is supplied and let the computer learn and interpret on their own. Increasing use of competitive intelligence and advanced analytics escalating data driven decision making is one of the key driving factors in the cognitive systems, content analytics and discovery software market globally. It is very difficult to access and keep track of each and every individual data due to the rise of big data. Therefore, it is necessary to implement competitive intelligence and advanced analytics tools that are likely to help gather, examine, and distribute intelligence of products, competitors, and customers, and also help discover deeper insights, generate recommendations, and make predictions. These tools help identify potential opportunities and risks beforehand. Advanced analytics techniques comprise data mining, text mining, pattern matching, graph analysis, and neural networks. Competitive intelligence is focused on external business environment and is involved in collecting information and converting it into intelligence, which is then employed for making decisions. Presently, business intelligence tools require very less support from the IT department. The changes in how data is visualized and mined allows the business activities to work with analytics tools and make data driven decisions with or without any technological background. Increasing volume of data tends to increase the need of data driven decision-making software that easily derives actionable data in real-time. Utilizing the analytics and discovery software is likely to support organizations in making decisions and anticipate the market trends and possible risks. Based on application, the global cognitive systems, content analytics and discovery software market is bifurcated into machine learning, natural language processing, automated reasoning, speech analytics, text analytics, social media analytics and others. On the basis of industries, the market has been bifurcated into banking, retail, healthcare, IT and telecom, transportation and others. Moreover on the basis of deployment type, the market has been bifurcated into on premises and cloud. The regional split of the market encompasses North America, Asia Pacific, Europe, Middle East and Africa and Latin America.